Logically, we can say that no one type of cupcake is better than any other, and everyone is entitled to their personal preferences. But secretly, we all feel that there is one type of cupcake that is just a bit better than all the alternatives, one flavor pairing of cake and frosting (assuming that they’re both good quality, of course) that is just plain better than the rest. A vanilla cupcake with vanilla frosting is the one that takes that place of honor for me. It may sound boring at first when you compare it to the alternatives of fudgy chocolate, rich red velvet or zesty fruit and citrus-laden cakes, but the flavor is simple, clear and oh-so-satisfying. I often bake cupcakes for other people or special occasions, but this batch was for me and I decided to fall back on the vanilla on vanilla combination. For the cake, I used a slight variation on one of Cupcake Bakeshop’s cupcake recipes. I felt a bit inspired by the fact that I had some of the same type of cupcake wrappers she uses, I suppose, and I liked the fact that this particular cake recipe uses the simple creaming method (cream the butter and sugar, then add dry ingredients) instead of the more involved technique of cutting the butter into the dry ingredients first (often my preferred method because it makes the cakes so tender). I used vanilla extract, rather than vanilla sugar, to give the cakes a good vanilla flavor, and chose to use buttermilk as the primary liquid. The resulting cupcakes completely lived up to my expectations. They had a good texture – sweet and tender enough not to be mistaken for muffins, but not so light that they crumbled when I bit into them – and were quite moist. I actually used a type of vanilla extract that has vanilla beans in it, so they had a nice speckled look to them, as well as a lovely vanilla flavor. Since I already had some vanilla bean buttercream on hand, I used that to frost the cupcakes. If you don’t want to make the whole batch – which will definitely give you extra frosting – you can go for a simpler quick vanilla buttercream and still get great results with the cupcakes. Place 20 muffin wrappers (if using the stiff kind pictured above) on a baking sheet, or line 20 muffin cups with paper liners. In a large mixing bowl, cream together butter and sugar. When light and fluffy, beat in the eggs one at a time. In a medium mixing bowl, whisk together flour, baking powder and salt. In a measuring cup, combine the buttermilk and vanilla extract. With the mixer on low speed (or by hand), stir one third of the flour mixture into the butter mixture. Blend in half of the buttermilk, followed by another third of the flour mixture. Stir in remaining buttermilk/vanilla and the rest of the flour, mixing only until no streaks of flour remain. Divide evenly into prepared muffin cups, filling each about 2/3 full. Bake for 22-24 minutes, until a tester inserted into the center comes out clean and the top springs back when lightly pressed. Cool in pan for 2-3 minutes, then transfer to a wire rack to cool completely before frosting. Heat 3/4 cup sugar and 1/4 cup water in a small saucepan. Heat over medium high heat until sugar is dissolved. When sugar reaches 230F on a candy thermometer, turn mixer on medium high. When egg whites are frothy, add cream of tartar. Gradually add the 1/4 cup sugar. When egg whites begin to form soft peaks, turn the mixer down to medium low and begin to drizzle in the boiling sugar mixture (which should be at approximately 245-250F, firm ball stage). When all of the hot sugar is added, turn the mixer up to medium high and beat until the bowl is no longer warm to the touch. Add the butter one lump at a time and continue beating until mixture is smooth and fluffy, approximately 12-20 minutes. It will look rather like ricotta cheese for a while – just keep beating! Once it is smooth, scrape vanilla bean and mix in the vanilla specks (or use 1-2 tsp vanilla extract). Keep at room temperature – do not refrigerate before it has been spread on a cake or cupcakes. Do you think there would be a problem substituting soured lactose-free whole milk for the buttermilk? This sounds delicious! Could you use oil in place of butter? I’ve always read that oil in cupcakes makes for a more moist result. What do you think? Yum. I’m really motivated to buy a mixer now. Gosh, they’re very pretty. I can’t seem to find those cupcake papers at the grocery store. I think maybe a craft store might have them…but I never go to craft stores. i like the muffin wrappers. where did you get them from? i don’t see them at the grocery stores, i only see the tin/paper ones–the ones you look remind me of those little things for ketchup at in-n-out! Just wanna ask, how do you make your buttercream so white in color? The italian buttercream I make is always a pale, yellow color because of the butter. But really, a white buttercream would be very much easier to color and decorate with. I’m with you, vanilla is my love and vanilla cake with vanilla icing sounds awesome–particularly when using good vanilla. Can’t wait to try this one. Thanks for being my favorite baking site to visit and all the great recipes and info. those cupcakes sure look yum! btw, just wanted to let you know that I linked you in my blog and I have been following your recipes and they have all turned out great. Thanks! The cupcakes looke lovely. I especially like those cupcake wrappers. I cant seem to find them anywhere in Toronto. Is there a website that sells them? To the poster who asked whether oil can be subsituted, the answer is no. A cake that uses butter relies on the creaming of the sugar and butter to work air into the batter and therefore the texture and lightness of the cake greaty relies on it. You still haven’t shared where you got those cure little cups for the cakes. Inquiring minds need to know. Love your blog. Thanks for all your effort. I too have searched for the cup liners shown in the picture. Can you tell us where they can be ordered? Cupcake liners are great, but what I really want to know is…what is this vanilla extract with vanilla beans in it and where can I get me some? hi.. nice cupcakes… i’m from singapore too.. may i noe what do mean by cups.. how many mls? 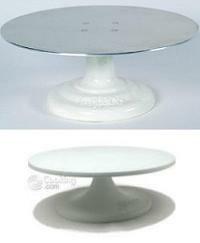 I have been looking for these cupcake holders everywhere!!! All i can find are the tiny ones, like nut cups. Please tell me where you got yours as I have searched for over a month. Thanks so much for all your lovely ideas. hey..is that recipie Just to make 20 cakes because im baking them at school and am only alound to make 9 or ten cakes so i need to know how to make 9..
Made cupcake batter, spooned into cases, spotted last third of flour mixture still to be mixed in. I’m sure they’ll taste alright…just slightly overworked. Just made these – even without the frosting they’re great. Good butter-vanilla flavour. Light but solid enough for decorating. The buttercream frosting was a little too buttery-tasting for me. Maybe I should’ve stopped @ 3 sticks instead of 4 – 1 1/2 cups. can I put my cupcakes in the refrigerator once I have iced them? I too would like to order those cupcake wrappers online. Can you tell me where I can get them? Much much appreciation. I’m pretty sure they are 3.25 oz. paper souffle cups and if you Google that term, you will find lots of websites that sell them. I know for sure they sell them at Smart and Final. I love vanilla – vanilla cupcakes and I’ve been on a quest to bake ones that are moist, perfect, & simply the best. My vanilla cupcakes always turn out to be dry and cornbread-like. Meanwhile, the american buttercream i often see in a lot of recipes is way too buttery and sweet for me. I hope that your vanilla bean cupcakes and italian buttercream will mark the end of my journey! I’ll definitely post the results when i buy a candy thermometer and those beautiful souffle cups. P.S. How in the world did you pipe that frosting in the picture? It’s lovely! These look beautiful. 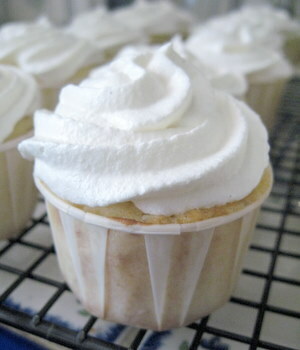 I realize this is quite an old recipe, but where did you get the cupcake liners from (if you can recall)? I can’t find them anywhere! PS I make your snowball cupcake recipe every year now — new Chirstmas favorite! How are these cupcakes compare with the Vanilla Buttermilk Cupcakes recipe you posted on June 28, 2007? Which one is more moist? Would cake flour make them more moist instead of AP flour? Lauren – These cupcakes are a bit richer overall. They’re quite moist, thanks to the fairly large amount of sugar in the recipe, and they’re nicely tender. You will get good results with all purpose flour in this recipe, but if you want to try cake flour, just increase the overall amount of flour by a couple of tablespoons – and don’t forget to sift it to prevent clumps! I tried this one today. Though the batter tasted great, the cupcake didnt turn out as it should have. Firstly, i had halved the recipe. Secodly, i am a vegetarian – no eggs – so i substituted eggs with a quick home fix of 2 tsp each of oil and water plus 1 tsp of baking powder. Third – i used whole wheat flour instrad of all purpose. I know thats a lot of tweaking but still i wonder what exactly went wrong. The texture is too soft and feels half baked – i can still taste the flour:-( amd my vanilla essence always seems to leave back a bitter aftertaste no matter what quantity i use (i am purchased d best quality vanilla available here though it was in oil base – past cupcakes made with local cheap essence used to turn out even worse). I would be really grateful if you guide me with my baking pursuists. I am slowly loosing nerve to emter the kitchen again due to bad results every single time!! Charmie – Don’t lose your nerve! Baking should be fun, not stressful. IF your vanilla is oil-based and it is leaving a bitter aftertaste, the oil could be rancid. Look for an alternative that is not oil based. You may have to purchase vanilla online if you can’t buy it in your area for some reason. Whole wheat flour will also impact the density of the cake, especially in a cupcake where it can be very noticeable when you use a heavier flour. Whole wheat flour also has a much stronger flour flavor to it than all purpose. I hope this helps. I would recommend only making one change at a time in the future. It’s easy to have a domino effect if you make multiple changes at once in one recipe. Can I use this recipe to make a two layer cake. Jessica – Yes, You could use this recipe to make two 8-inch cake layers. Would 9-inch pans be okay?